After seeing many rave reviews about the authentic Sushi Hachi on various Vancouver food blogs, I decided to check it out for myself. I had some errands to run at Richmond Centre and didn't want to use up another bus pass just to get to Sushi Hachi, so I decided to walk the 2.8 km distance between the two. It wasn't tiring at all; in fact, the only nuisance was the fact that I was constantly pestered to join this and that. I have never felt so wanted before. Sushi Hachi's main focuses are nigiri sushi and sashimi. As you can see from the photo above, all they have for cooking are a few pots and pans, so don't be expecting teriyaki or udon at Sushi Hachi (there is nothing of that sort on the menu). I also heard that they are wary of food bloggers who take photos and then post rave reviews because they are worried that the regulars won't be able to get seats anymore. Not a problem at all. I discreetly opened up a WeChat conversation and texted all my notes and photos to myself instead of bringing out my notebook. The Chef's Choice Sashimi came with 7 kinds of sashimi, each sliced into very small pieces. The thickness of each piece was just right, but I wish the pieces were larger so that I could taste the flavours better. Nonetheless, the Kampachi Sashimi (yellowtail) was delicious with a thick, buttery texture. The Tako Sashimi (octopus) had just the right amount of chewiness, while the Shima-Aji Sashimi (Japanese striped jack) was softer and sweeter than the Kampachi (though they look nearly identical). 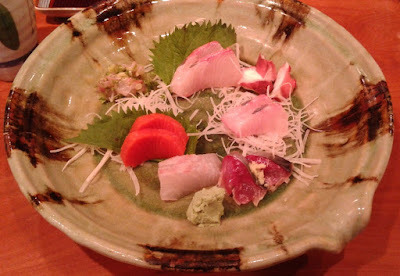 The Saba Sashimi was rich in taste, had a deep burgundy colour, and was garnished with grated ginger. The Madai Sashimi was less rich in taste, and the Sockeye Salmon Sashimi lacked a smooth texture. The Aji Sashimi was sliced into thin strands and accompanied by green onion. Sushi Hachi seems to struggle with constructing sushi rolls. 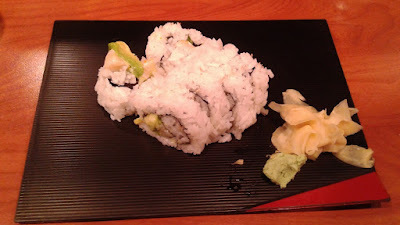 The sushi rice of the Chopped Scallop Roll was very well-prepared and tasty, but there was way too much of it. The roll was like 80% rice and 10% chopped scallop! I'll give it to them that the ingredients were fresh. 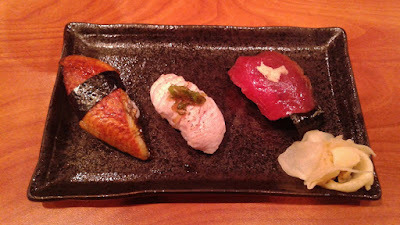 The Unagi Nigiri ($4) was very expensive, but it looked so delicious in the box that I had to try it. It was served at a piping hot temperature and was very soft. I loved everything about it except for the fact that it was a tad bony. The Aburi Toro Nigiri was deliciously seared and was very soft and juicy. The Marinated Red Tuna Nigiri was accompanied by grated ginger and seaweed, which helped liven up the flavour of the tuna. 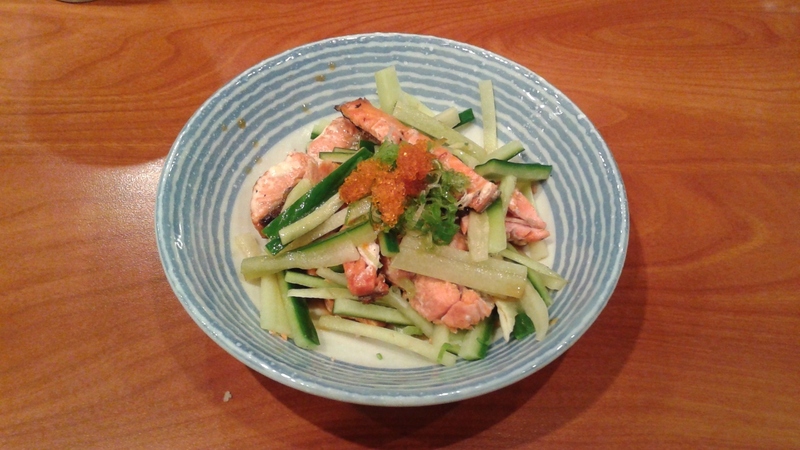 The BBQ Salmon Salad came with BBQ salmon skin, cucumber, masago, green onion, and ponzu sauce. I greatly enjoyed the subtle smoky flavour of the salmon and the ponzu sauce was not overwhelming at all. At $5.50, I consider this one of the best things to order at Sushi Hachi. The portion size was decent and it was masterfully prepared. Overall, the service was very friendly and this was complemented by the pleasant, relaxing atmosphere of the restaurant. The restaurant is not large and reservations are a must on any day due to their very limited hours (6 to 9 p.m. from Tuesday to Saturday). Every diner without a reservation was turned away. The sashimi, the nigiri sushi, and the BBQ Salmon Skin Salad were all very delightful, while the sushi rolls could use some improvements. The higher prices were justified by the freshness of the ingredients. Well, here it is - another positive review for Sushi Hachi. 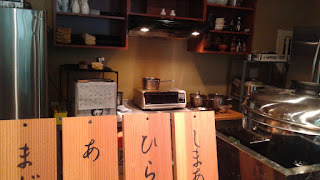 Sushi Hachi, how about even more customers?